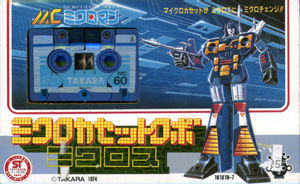 Featured above is the front and back box art for Micros, a Micro Cassette Change Robo. Micros is one of three Micro Cassettes designed to fit into Cassetteman's chest. Micros comes with a clear plastic cassette case and a set of two silver guns that mount on his back. He is actually the least interesting of the three Cassette Change Robos, transforming into a robot rather than an animal figure. He is still a very cool little piece. 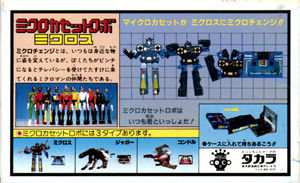 The actual box for Micros is not much bigger than what is shown above, making him one of the smallest Microman pieces in the line.